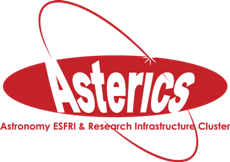 Several open access libraries were developed in the context of ASTERICS. COsmic Ray Event Library (CORELib) is an open access library of ready-to-use simulated cosmic ray events (made by CORSIKA). The data (550 GB for the first production) are temporarily hosted in an SFTP server at the Department of Physics of the University of Salerno, but we plan to migrate to a GRID-acccessible repository for the final production that should fit within 100 TB. We simulate showers from primary cosmic rays as observed at sea level with primary cosmic ray inclination up to 89°. Several hadronic interaction models have been used to offer a wide choice to users. CORELib is also interesting for other communities like geophysics and cultural inheritance. It contains a wealth of simulated data for very high energy, which is interesting for muon radiography of volcanic edifices, faults, pyramids and other large structures. ROot extensions for ASTronomy (ROAst) is an open access library designed to be included in the ROOT framework, commonly used in the high-energy physics community. ROAst adds functions for astronomical coordinate transformations, motion of the Moon and planets, relative position of the Sun and access too off-line (UCAC4, URAT1) and online astronomical catalogues (Virtual Observatory and VizieR). Selection and graphing functions are also included. BeeGFS on SOC: Parallel filesystems are a key component of every HTC and HPC clusters. Using such filesystems on low power SOCs such as ARM or x86 give the possibility to deploy cost effective storage volumes with respect to usual storage appliances. A promising low power CPU that provides server-grade performances with a low TDP is the Intel Xeon-D. A small cluster was set up using the BeeGFS filesystem developed by the Fraunhofer institute and benchmarks are made available.